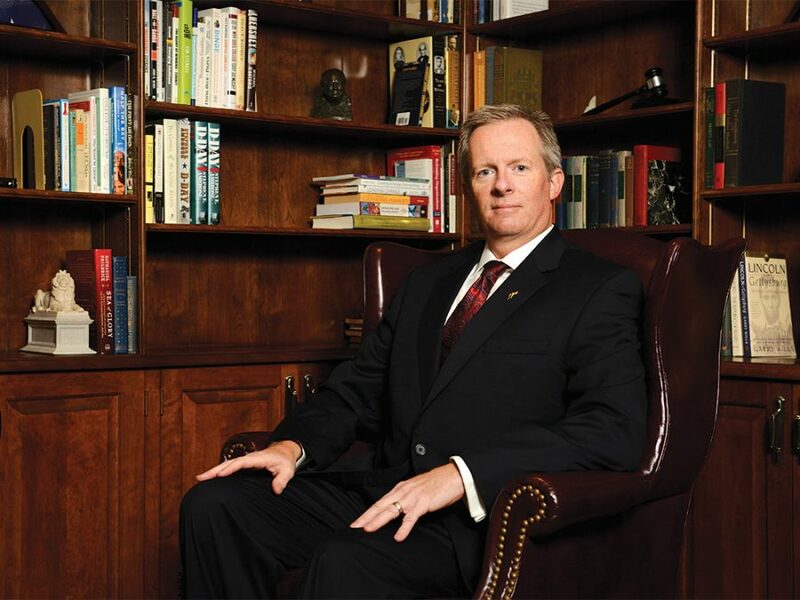 Most readers of Austin College Magazine know that Steven P. O’Day became the 16th president of Austin College in fall 2017. Most have read of his career, which began in law and transitioned into higher education, beginning at Franklin & Marshall College in Pennsylvania, where he shared his talents as women’s soccer coach and soon found himself drawn into other roles in student affairs and academics. 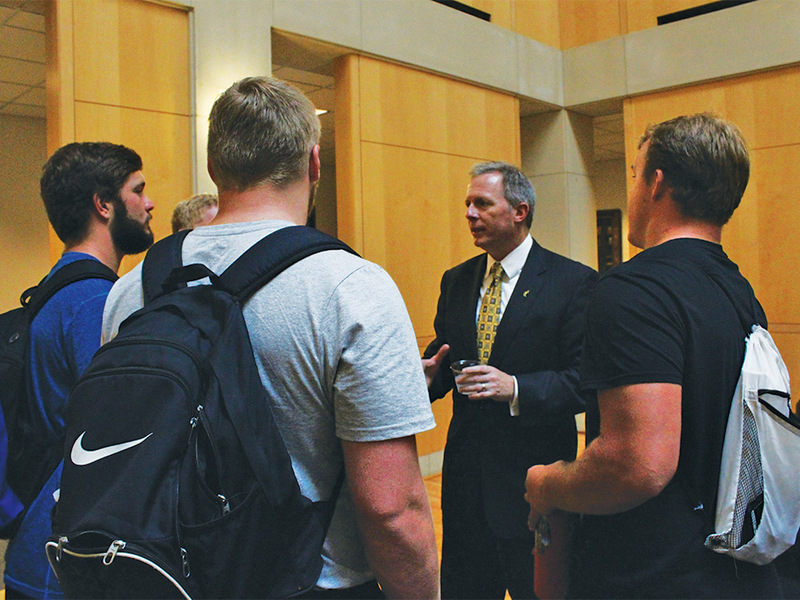 Because President O’Day began his duties mid-semester in fall 2017, readers may not know much more about him. The campus community knows he hit the ground running and has not stopped yet. From his first days on campus, he has shown up most everywhere—music performances, art exhibits, swim meets, soccer games, basketball practice, the dining hall, a Star Party in Adams Observatory—and all that activity was outside the “regular” work day. From 8 to 5 each day, he had a steady flow of meetings with staff and faculty to soak in all he needed to learn and to share his own plans and vision for Austin College. He hosted visitors and trustees and met students and prospective students. 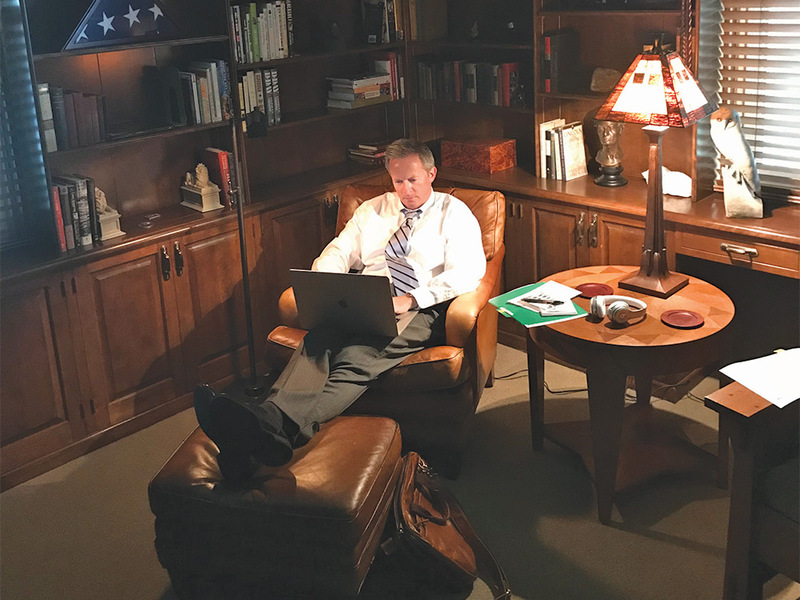 Meanwhile, he began to learn about his new hometown, even attending a local high school football game as the guest of the Sherman ISD superintendent. He celebrated victories and dealt with the sad news of the death of a current student in a local auto accident. The best of times and the worst of times. The life of a college president. Here, in the following questions and responses, we offer a bit of insight into his vision and his goals. The rest you will see play out over time; he’s not slowing down. What about Austin College most interested you and drew you here? What drew me to Austin College is the fact that the College’s mission, its educational philosophy, and its ethos to educate the whole student in and beyond the classroom match my calling to prepare students to make the world better. In short, I like what Austin College does, and I like how it does it. The College offers comprehensive programs while also offering comprehensive support of students in a personalized fashion. I believe this student-centered approach to educating our students will be a key for success in this time of unprecedented competition in the higher education marketplace. 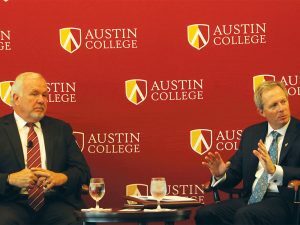 Austin College’s commitment to stay true to its mission while recognizing the needs of the 21st-century learner resonates with me. 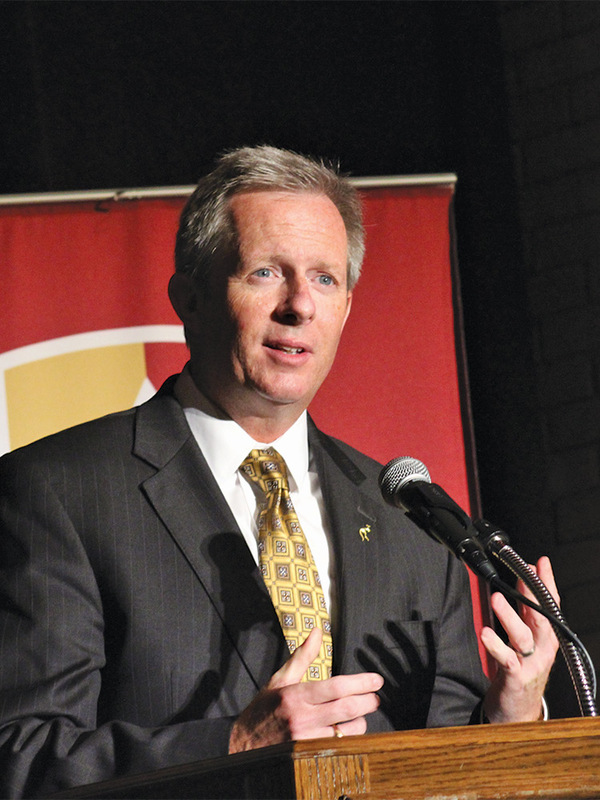 What do you see as the greatest strengths of Austin College? I see a college that transforms students so that they can transform the world. I see a college that educates through personal relationships and experiences in and beyond the classroom. 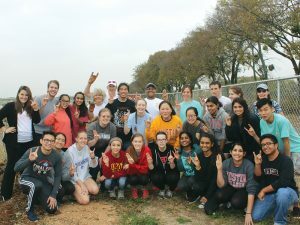 Of course, the strength of Austin College’s academic programs is renowned but I see the College’s dedication to the development of close personal relationships between students and all of their mentors—professors, coaches, staff—as a strength that makes Austin College truly special and fills me with optimism for the future. What do you think are the biggest challenges before higher education today? I see the path forward as one rich with opportunities but not without its challenges. Both the opportunities and challenges stem from a national debate over the value of higher education—particularly one rooted in the liberal arts—its affordability, and its accessibility. I see a liberal arts education as an unmatched preparation for a life of learning, leadership, significance, service, and integrity in the 21st-century global community. I believe that at no time in history has the value of a liberal arts education, an Austin College education, ever been greater. Studies show that the vast majority of new jobs created since the Great Recession (2009) require college-level education. We further know that those with a college education stand to earn, on average, $2.8 million more over a lifetime than those with a high school degree or less. While these numbers, alone, present the argument for higher education, further statistics make the case for the kind of education that Austin College provides. We know that in survey after survey, employers prefer those people who are critical thinkers, collaborators, clear communicators, and are able to adapt and problem solve creatively. We know that countless jobs that will exist 10, 15, 20 years from now do not exist now. That, coupled with a U.S. Dept. of Labor statistic that projects that our young people will experience, on average, 10-14 jobs by age 38, tells us that the value of an Austin College education exists not only in preparing our students for their first job but, perhaps even more importantly, for their fifth job, their seventh job, their 14th job. There are those who argue that the era of a liberal arts education is over. I argue the opposite. 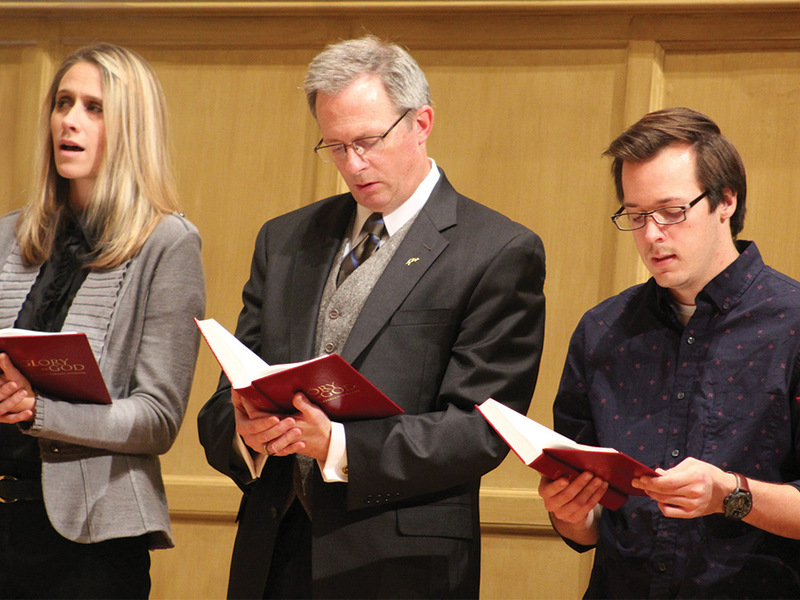 This is a golden age for a liberal arts education. This is a moment to champion what Austin College does and how we do it. This is a moment to be confident and bold! 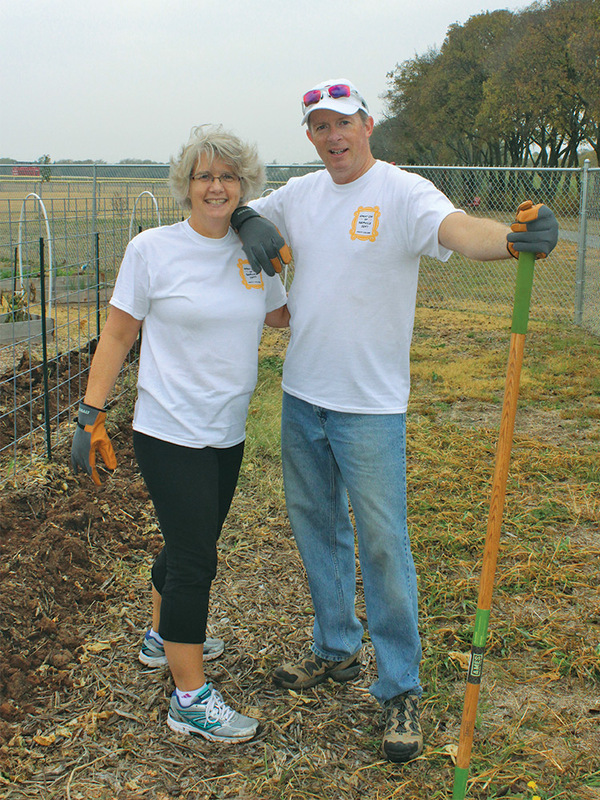 President O’Day and Cece were right in the midst of things for the College’s Great Day of Service on November 4. More than 300 students took part in the annual volunteer event that assists more than 40 local nonprofits. The O’Days joined 25 to 30 of their newest friends from Alpha Phi Omega national service fraternity in a project at Pottsboro Community Garden that had them digging rows and planting seeds, among other assignments. The president already had the ’Roo sign well in hand, even while wearing work gloves! 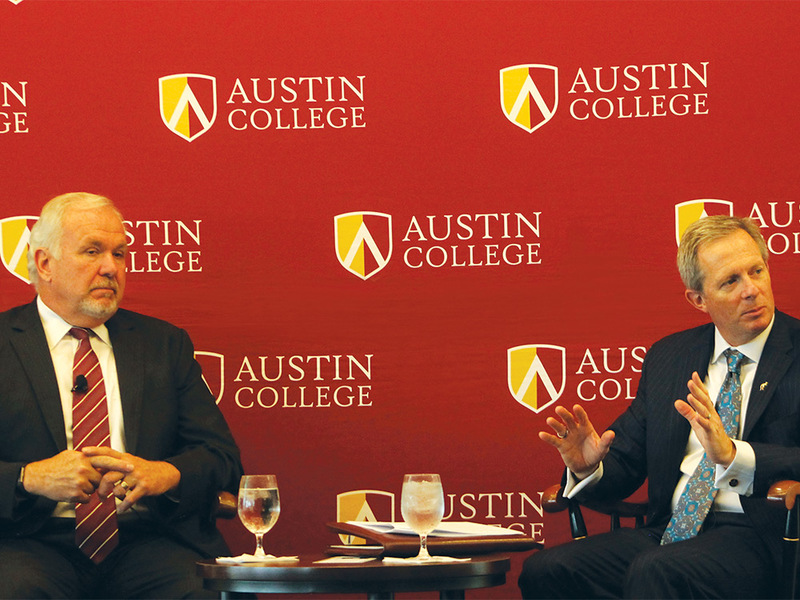 What are the challenges before Austin College—and how should the College respond? There are, certainly, some very real challenges before us. Messaging, enrollment stability and growth, philanthropy, accessibility, affordability, retention, and speed to degree come to mind immediately. Enrollment management and stability will be vital. We must effectively convey to our students and potential students the true value of an Austin College education. Philanthropy also will be crucial to our success. The people of Austin College have drawn me here—their deep love of this place. Now will be the time for all those who hold the College dear, appreciate its mission, and embrace how that mission is accomplished, to step forward. I know they will step forward in the moment when it counts the most. For 168 years, they always have. Looking down the decades toward the College’s 200th year in 2049, what would be your dream for the College? Since you’ve only just arrived, maybe we should start with just a few years? In five years or 50 years, I see a vibrant Austin College that continues to embrace its mission while also being responsive to the needs of learners in the moment. 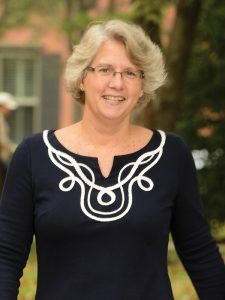 I envision a campus with facilities that allow faculty, staff, and students to teach and learn in and beyond the threshold of the classroom in ways that prepare them best for a successful future in an interconnected global community. What is your highest priority for the coming year? This year, my priorities will be to listen and learn the culture of Austin College; to identify and prioritize initiatives that will advance the mission of the College; to begin to implement those initiatives and strategic investment opportunities that rise to the top when we think about how to enrich and enhance the student experience. I am a team builder. I like to work collaboratively, listening, inspiring, and empowering people to develop ideas and solutions. Leadership is making those around you even better and providing the environment for them to do what they do best—their work. As president, I create an environment that does not fear failure but confidently moves forward, united in the knowledge that we are in this together, each with our role, sharing in our successes and resolving to do better should we fall short. What one or two messages would you want to communicate to our alumni and friends? Exciting things are happening here. Come see us. Be a part of it. We are still transforming students so they can transform the world. At 5 years old, what did you want to be when you grew up? What did you most enjoy about your own college experience? I discovered some areas that interested me that I had never been exposed to before. For example, I had a music appreciation class I really enjoyed. It opened my eyes to an artistic world that I had, until then, largely overlooked and underappreciated. The same was true for a Studio Art class. I signed up for the same English professor three semesters in a row because she helped uncover an interest in me that I didn’t even know I had. The same was true for a professor in a Hermann Hesse seminar. All these courses felt very “collegiate” to me at the time. They inspired a love of learning in me that I carry with me today. We know you were a college athlete; articulate your commitment to Division III athletic competition. I went to college to learn and, yes, prepare for a career. In my case, I thought that career would be as an attorney. However, I also went to college for “something else.” For me, the “something else” was soccer. That “something else,” however, is different for everyone. We have to be committed to the “something else” too if we’re going to be relevant to students today. Athletics is part of that commitment. In fact, all co-curricular activities provide tremendous opportunities for student learning and growth. Education does not end at the threshold of the classroom. What precipitated your move from law to education? My path in higher education has been a non-traditional one. Early in my career, I assumed my work would always be in the legal profession. That mindset began to change when I was hired as the part-time head coach of women’s soccer at Franklin & Marshall College just after my own playing career had come to an end. Very soon into my tenure as coach, I began to realize how much I enjoyed working with student-athletes, not only on the soccer field but also as they navigated their entire college experience. When the opportunity arose to work full time on campus as the pre-law advisor, I seized it and have never looked back. 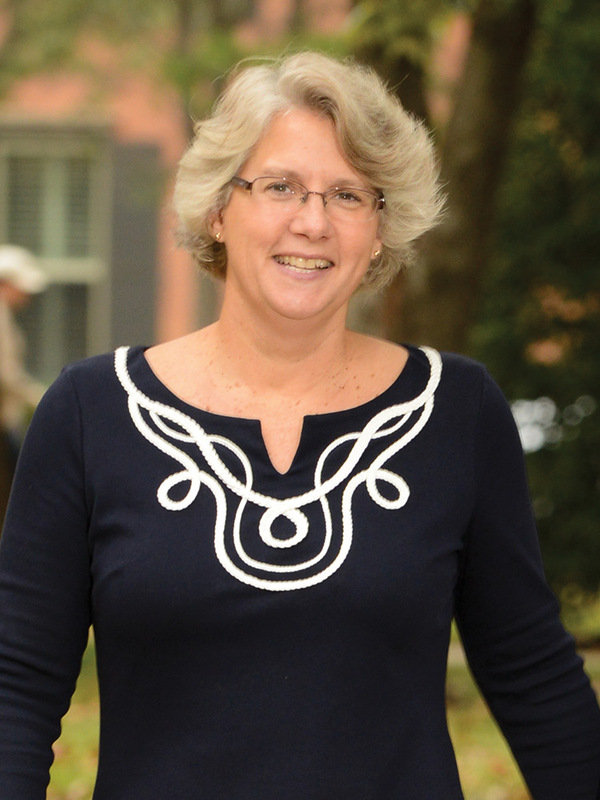 Starting as a coach and pre-law advisor, then, eventually, as a dean, business law instructor, and a vice president, I have had the rare and valuable opportunity to work in virtually every area of an institution of higher education. I’ve found that there actually isn’t much time away from work. I enjoy being engaged in the life of the campus. When I am in between meetings or calls or trips on behalf of the College, I like to stay fit. Several years ago, I began training for triathlons and enjoy that quite a bit. Cece and I also enjoy outdoor activities like kayaking and hiking, and I love to surf. Working out, running, swimming, being outside. Also, unwinding in front of the TV is nice, too. Netflix was a wonderful invention! What’s the category you could ace in Jeopardy? What talent would you love to have? You’re packing for a trip. What can’t you leave home without? Best trophy/award you ever won? Destination you dream of but haven’t gotten to yet? Favorite destination you have visited? We have loved our trips to London and the UK, but we go back to Ocean City, New Jersey, every summer. Must-have app on your phone? First website you access in the morning? Pets at 921 North Grand? None yet, but we are planning on a puppy in 2018. 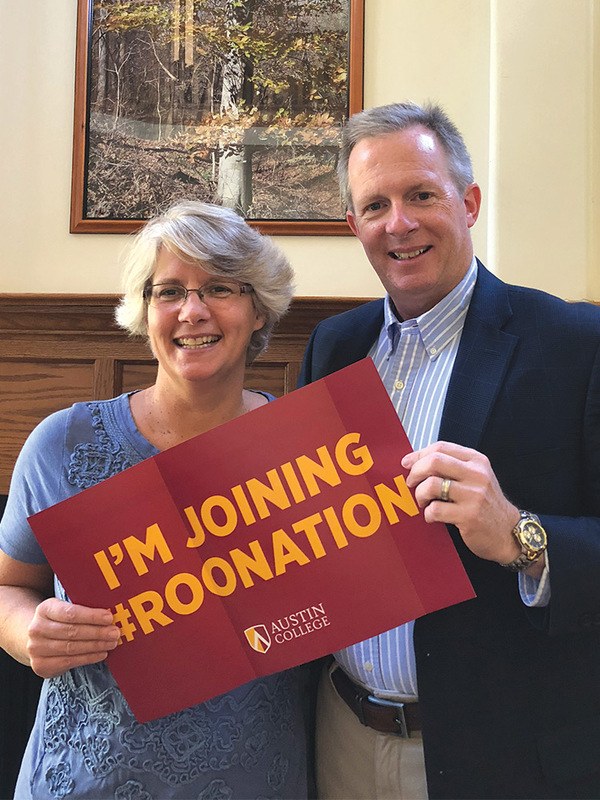 When President O’Day was introduced to the campus community last August, standing at his side was his wife, Cecelia, who goes by Cece, which seems quite fitting for the warm and friendly “First Lady” of Austin College. In the first few weeks that the O’Days were on campus, Cece said that already she felt a part of the College community and looked forward to getting to know everyone. By year end, she had been a gracious host for campus and community events at the President’s Home and taken part in many college events, so she clearly is well on her way to “knowing everyone” and becoming acquainted with the ways of ’RooNation. Before coming to Sherman, Cece spent 18 years in the classroom as a high school English teacher, mostly of ninth graders—which means she has taught Romeo and Juliet many times. Those years and more, she spent as the high school swim coach; she also had opportunities to coach swimmers aged 4 to 87. Coaching was a natural extension of her own lifelong love of swimming. She has competed on a club team, in college, in Master’s meets, and in a few open water swims. The English teaching may, too, be a natural extension of her own love of reading. She also describes herself as a “foodie” and loves to cook and bake. The outdoors and physical activity also are important to her. She enjoys walking, hiking, and kayaking with her husband. They also enjoy travel, as President O’Day mentioned in the preceding Q & A, and family time. The O’Days have an adult son, Ryan, who lives and works in the greater-Boston area. Cece’s parents, sister, and 12-yearold niece live in Lancaster, Pennsylvania. Steven also has a brother and sister in that area and nieces and nephews within Pennsylvania and the Washington, D.C., area. Cece says she plans to give her attention to home, Steven, and the Austin College community and will not teach in Sherman. That’s her official plan; the College community may well learn much from the talented First Lady and her experiences in the days to come.